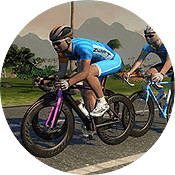 Watopia’s “Four Horsemen” route covers all four timed climbs: the original Hilly KOM, Volcano KOM, Epic KOM, and Alpe du Zwift. Along the way you’ll also cover (nearly) every bit of road on Watopia, so it’s a complete tour of our virtual fitness paradise. This is no leisure tour, though: be ready to work as you climb over 2000 meters in just under 90 kilometers! “Four Horsemen” isn’t quite the longest route on Watopia, but it’s the climbiest one. And be warned: hitting the Alpe after working your way over the previous climbs proves to be both a mental and physical challenge. Prepare yourself! 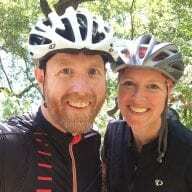 Just did the four horsemen route and it was a hard ride. Being a bit pedantic here but I don’t think it covers every stretch of road on Wattopia. I didn’t recall going through the volcano banner. Ah, good catch Jon! You’re right… it covers the northern half of the volcano circuit, but not the southern half which includes the banner. I’ll update my post accordingly. Really looking forward to riding the four horsemen….the epic KOM is just the warmup! Any ideas how long it will take in hh”mm to cover this route with 2,5W/kg; 3W/kg? It took 98k to ride all roads but the 3 sisters Route, with a turn into the Jungle and Alps climb, finished with a Flat Route covers all roads in Watopia. You say that: ““Four Horsemen” isn’t quite the longest route on Watopia, but it’s the climbiest one.” Which route on Watopia is longer?